However you choose to tailor your Loreto vacation, you can’t help but enjoy the simple pleasures in life here. While riding my bike to a friend’s house the other day, I happened upon a hummingbird sipping from a fountain, and was lucky enough to capture the moment on camera. Then I rode on, and parked my bike by a pot of vibrant bougainvillea flowers, which contrasted gorgeously against the rich yellow walls of the courtyard. 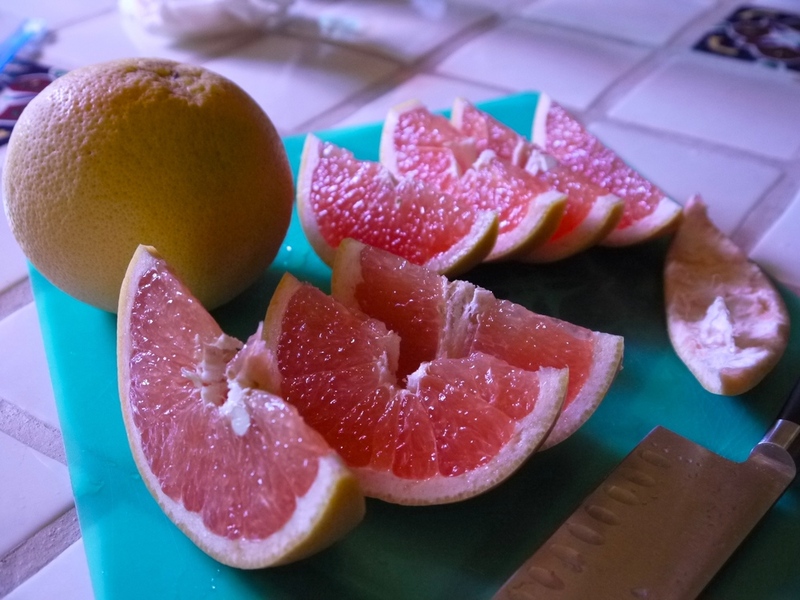 When I arrived at my friend’s house, we ate freshly smoked yellow tail tuna, caught by some Loreto guests the day before, and juicy pink grapefruit, picked from the tree in his backyard. Few places in the world are this beautiful and have so much to offer. I hope that when you vacation in Loreto, you appreciate these simple pleasures as much I do! Picking fresh grapefruit from a backyard tree- one of the little things that makes a Loreto vacation so magical. Posted on March 12, 2014 by Gillian Milne and filed under Loreto vacation, simple pleasures, magical Loreto and tagged Loreto vacation simple pleasures.